As you know, I only blog about the games I host at the casa. It has been pretty quiet as of late. Both Terry and Ken have filled the Thursday night scene with wonderful games (the Penny Whistle blog covers them). While I've been relatively active gaming-wise, it hasn't shown on these pages. It was a low-key night for the group and consisted of Jon Mark, Terry and myself. After much debate, I decided to try a new track for the group's racing game of choice: Going the Distance (GtD). 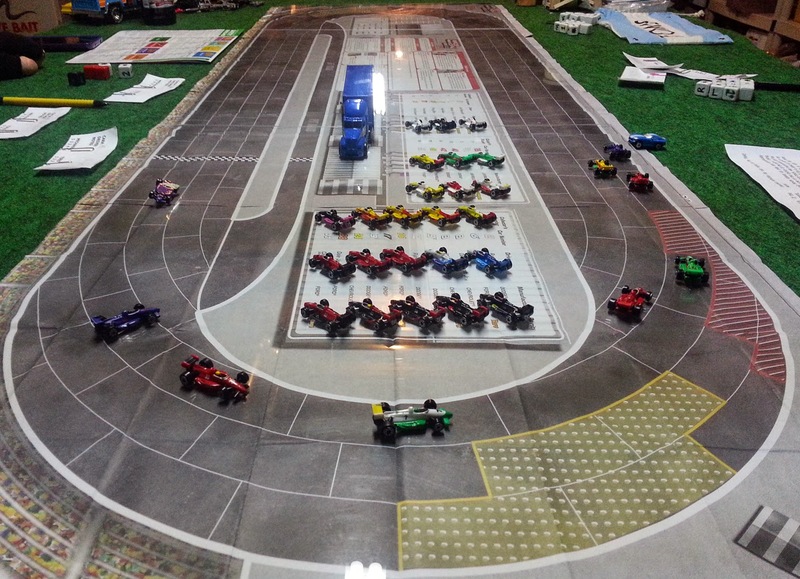 The track is from the out-of-print WizKids game, Race Day. This game was produced in 2005-2006 and ended abruptly when NASCAR and WizKids had some sort of falling out. 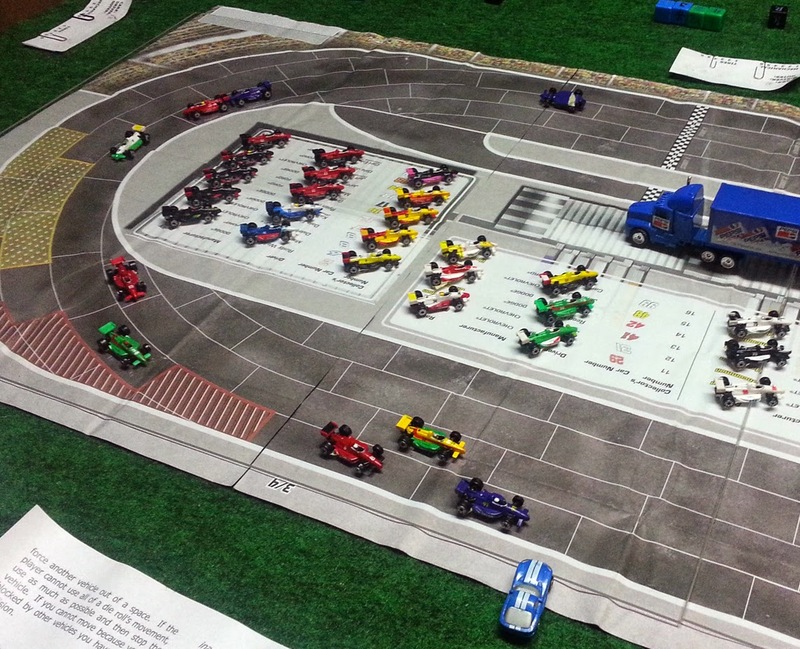 The game featured constructible styrene race cars and simple rules for damage. It wasn't the greatest game, but it did give me a very large track on which to play GtD. Unlike other GtD tracks, this one featured lanes that started and ended in the turns. It also featured some interesting challenges pertaining to tire wear and centrifugal force 'slipping'. I made the rule that everyone was using "A" compound tires. While not as durable, they give the driver a dedicated handling die (Note - If that means nothing to you, the original rules are available through the link I included earlier). 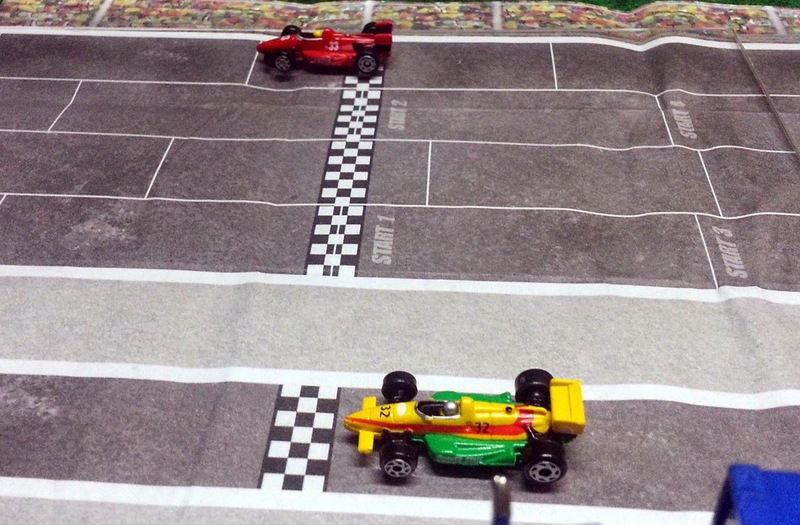 Also, the pole position rules had to be reversed due to the track's nature, meaning that the pole driver started on the outside lane instead of the inside. I know this isn't 'accurate', but it was the only way it worked with the map. We also had to modify the pitting rules to accommodate the track. Pitting proved to be much more difficult than normal and definitely was a strategic factor in the game. We started with three cars apiece. 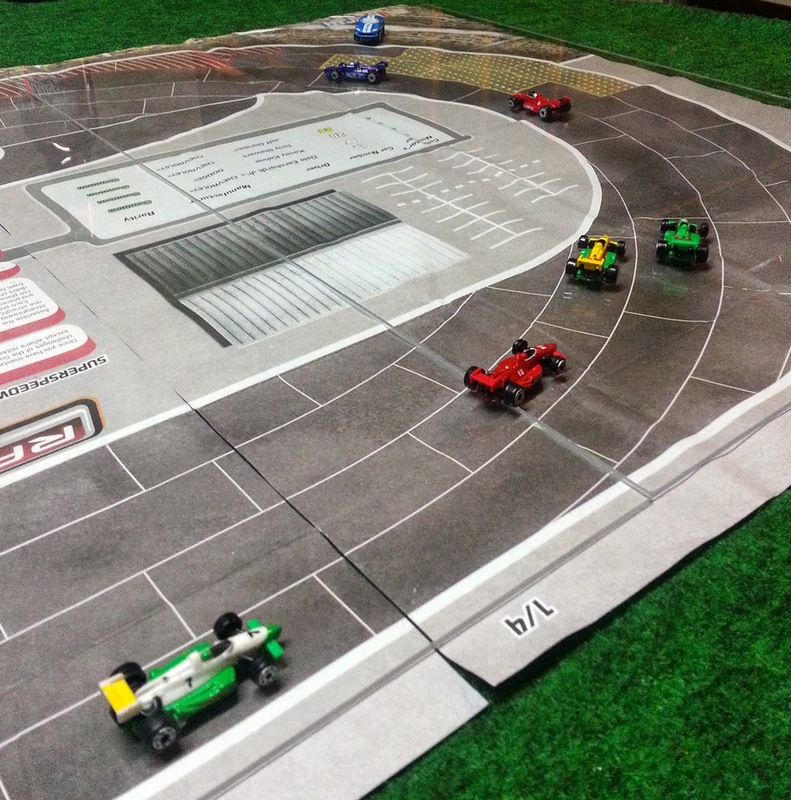 The race was five laps, with the 'field move' consisting of 3d6. This proved to be perfectly suited for the track and yielded some fantastically chaotic results! Terry won the pole, with the rest of the field following behind. His lead car shot out quickly, with Jon Mark and me following closely. 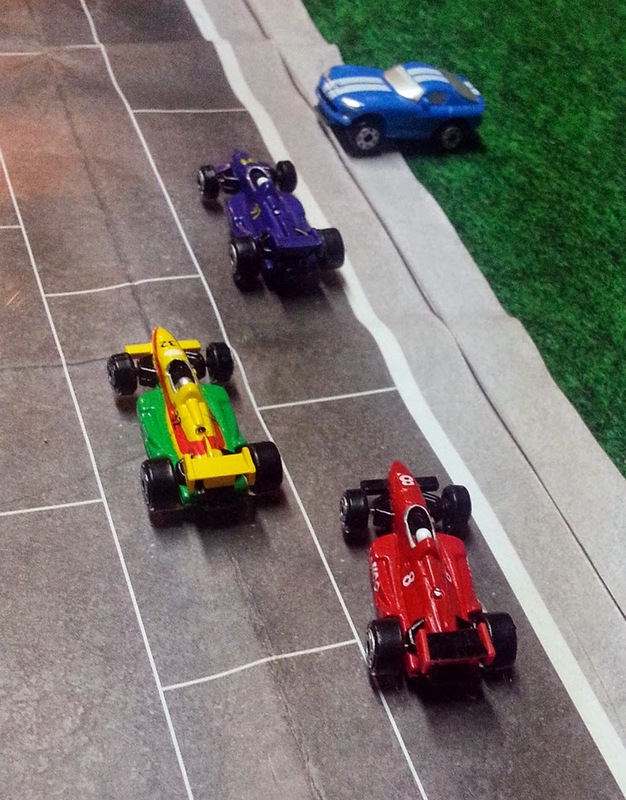 Some deft maneuvering and lucky dice rolls led to the front of the pack looking like this: Terry's purple car leading the race, with my car hedging out Jon Mark's Ferrari. The blue Viper is used to indicate the race leader and is a key component to GtD. ...while his third car rammed the back end of Jon Mark's car (Terry's is the purple car turned sideways in the lane in the photo below. This indicates he's collided and stopped). Fortunately, this happened at the end of the first turn, so it didn't negatively impact (pun intended) anything but the two cars involved in the collision. You can also see how cool the track looks. Around we went. Terry managed to blow the engine of his lead car, leaving him with a final vehicle that struggled to keep up. It eventually got lapped and caused the lead cars no end of trouble before going DNF itself. Team Green (me) held the lead through most of the race. I was nursing depleted tires and was moving in to pit my front two cars when disaster struck. One of Jon Mark's cars blew a tire and flipped right in front of the pit entrance, effectively blocking me from pitting! With a prayer and a lead foot, I gunned my cars to make another lap. This proved to be catastrophic, as they in turn both blew out tires and wrecked. That left three cars on the track: Two of Jon Mark's and one of mine. Jon Mark's lead car "found the groove" and took the checkered flag, while my car pitted and regained much needed tires. In the end, Jon Mark won, while I took second. Nine cars started, two finished. That's some seriously bad racing, but it made for a fun, entertaining evening! The map played very well and with some slight modifications to the GtD rules, can be worked into the track rotation with ease.